Irish actress Ruth Negga was one of the people to make a political statement on a controversial Oscars night. THE MASSIVE MISTAKE that saw La La Land being named best film by mistake will dominate the headlines, but there was a political edge to last night’s Oscars ceremony. Last year, several black screen stars boycotted the ceremony, citing a lack of diversity after minorities weren’t represented among the nominations in the best actor and actress, and best supporting actor and actress categories. This year, from the host’s opening monologue to some of the victory speeches, issues of diversity and current political events got a wide airing at the awards ceremony. 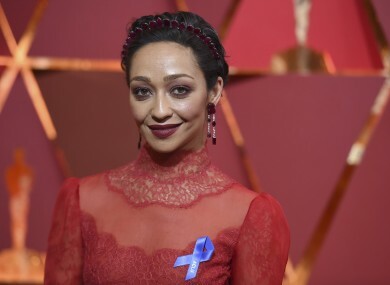 Irish actress Ruth Negga, who missed out on the best actress gong to Emma Stone, sported a blue ribbon on her dress in support of the American Civil Liberties Union (ACLU). The ACLU represented the woman that Negga portrayed in the film, Loving, in the landmark 1967 Supreme Court Case that saw Mildred Loving fight against her incarceration for marrying a white man. The host of the Oscars used his platform to make a string of pointed political statements in his opening speech. I want to say thank you to President Trump. I mean, remember last year when it seemed like the Oscars were racist? Mel Gibson’s film Hacksaw Ridge was nominated for a few awards, and Kimmel referenced one of Gibson’s most famous roles in another section of his monologue, when he said that people had been telling him that he needs to unite people with his speech. Let’s just get something straight off the top: I can’t do that. There’s only one Braveheart in this room and he’s not going to unite us either. He added that the Oscars were being broadcast in “225 countries that now hate us”, and expressed his relief that French Oscar nominee Isabelle Huppert was allowed into the country by Homeland Security. He also said that he was surprised that Trump hadn’t tweeted about the Oscars yet, so sent him one of his own. Several stars used the platform of the Oscars stage to issue messages embracing diversity and rejecting any form of division. Mexican actor Gael Garcia Bernal came on stage to introduce the nominees for best animated feature, but instead chose to make a statement on current relations between his home country and the US. I’m against any form of wall that wants to separate us. The President of the Academy, Cheryl Boone Isaacs, echoed this speech saying that films aren’t for any single person, and are meant for all, in a clear reference to the furore over a lack of diversity in recent years. She said that “art has no borders” and that it “does not belong to a single faith”. Iranian filmmaker Asghar Farhadi, who won an award for “The Salesman”, did not attend the ceremony. He didn’t even travel to the United States because of the travel ban, but sent a speech to be read out on his behalf. Dividing the world into the us and our enemies categories creates fear. [Filmmakers] create empathy between us and others, an empathy we need today more than ever. Director Ava DuVernay, whose film 13 was nominated for best documentary, tweeted a message of support for Trayvon Martin, the teenager shot in a Florida neighbourhood on the same day five years ago. Email “'Hey Trump, are you up?' There was a political edge to the Oscars last night”. Feedback on “'Hey Trump, are you up?' There was a political edge to the Oscars last night”.